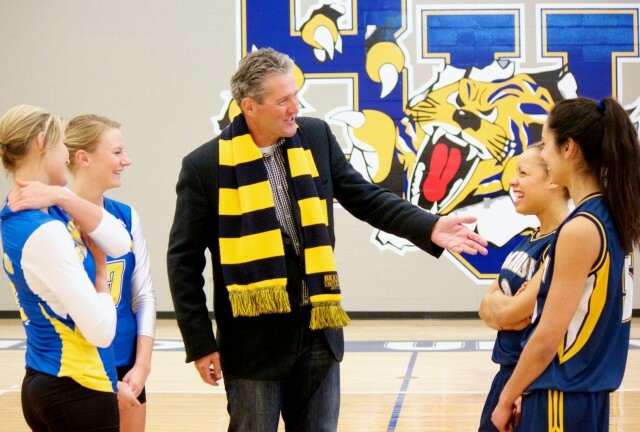 Brian Pallister meets with members of the Brandon University Bobcats in 2014. The surge of Progressive Conservative blue that covered Manitoba in Tuesday’s provincial election has some Brandon University blue and gold behind it. Brandon University (BU) alumnus Brian Pallister is Manitoba’s Premier-designate after his provincial conservatives stormed into power by winning a majority government. Pallister holds Bachelor of Arts and Bachelor of Education degrees from BU and is a former member of the Bobcats men’s basketball team. Among Pallister’s campaign promises were to partner with the private sector to more than double funding available for scholarships and bursaries to $20 million. In 2001, a donation by Pallister established entrance scholarships that award about $500 each to four BU students from the Central Plains region each year. Two years ago, a Pallister gift created a new scholarship that awards about $975 annually to a BU Bobcats female athlete. When he is sworn in, Pallister will become the first BU graduate to become premier of Manitoba. But he won’t be the first former BU student to sit in the premier’s chair. That honour goes to Douglas Campbell, Manitoba’s premier from 1948 to 1958, who attended Brandon College for two years in the mid-1910s. Campbell, who was also only the second person born in Manitoba to serve as the province’s premier, returned to BU in 1967 to be a recipient of one of the institution’s first honorary doctorates, sharing the stage with fellow alumnus and noted Canadian parliamentarian Stanley Knowles. There are many other BU connections to top political figures. Famed Brandon College alumnus Tommy Douglas was the Premier of Saskatchewan from 1944 to 1961 before becoming the leader of the national New Democratic Party and later named Greatest Canadian in a wide-ranging public poll. He, too, received an honorary doctorate from BU, in 1970. Honorary BU doctorates have also been awarded to former Manitoba premier and then-Canadian ambassador to the United States Gary Doer, in 2011, to then-Manitoba Lieutenant-Governor Peter Liba in 2004, and to then-Senator Sharon Carstairs, in 2003. And, former Manitoba premier Edward Schreyer served Brandon University Chancellor from 2002 to 2008. Joining the “BU caucus” of the next session of the Legislature will be Brandon West MLA Reg Helwer, who was re-elected on Tuesday. Helwer, who has a B.A. from Brandon University, was president of the Brandon University Students’ Union during his time here, and has also previously served as chair of the BU Board of Governors.